✔ GLASS BOTTLES TO-GO – With these one-of-a-kind water bottles, you can now travel with your favorite beverages in a glass container. Suitable for any outdoor activities - hiking, camping, jogging, traveling and more. Perfect for people on the go - just easily clip the loop cap to your bag or backpack. Leak resistant caps prevent messy spills. To keep you hydrated on your travels, get your own glass bottles now and enjoy every moment of your adventure! 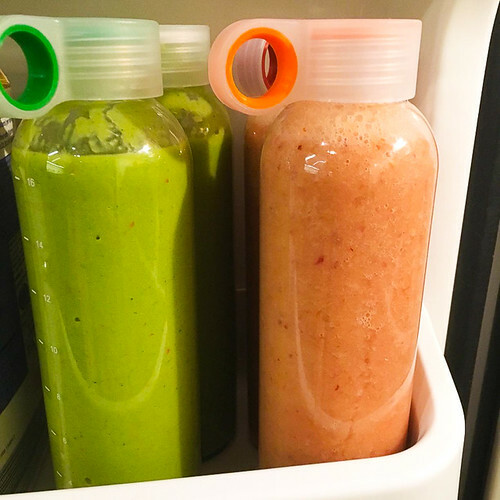 ✔ VERSATILE AND EASY TO CLEAN BOTTLES – Easily store up to 18 oz (20 oz) of water, juice, tea, smoothies, kombucha, cold coffee, and other drinks. Features larger-than-average opening for easy fill and refill. Measuring line shows exactly how much liquid is in the bottle. Bottles and caps are dishwasher safe, for easy cleaning. Unlike plastic bottles, these glass containers ensure that no residue or unwanted after-taste is left after cleaning. ✔ CLEAN AND SAFE DRINKING - Six clean glass bottles made from premium soda lime glass which is BPA-free, Phthalate-free, PVC-free, Lead-free, and Cadmium-free. Food grade plastic loop caps are FDA-approved. These are the portable glass water bottles you would want to get for you and your entire family. ✔ MEASURING LINES - Bottles have measurements lined in the glass, which show how much liquid is in the bottle. These measurements help you keep track of your liquid intake. Our Clean Glass Bottles with Loop Caps Are Perfect for Everyone! Do you hate the aftertaste of metal and plastic containers? If you do, you’d love our Glass Bottles with Loop Caps. It’s made from soda lime glass that is 100% recyclable and does not leach harmful chemicals or unwanted flavors into your drinks. ✔ MULTI-COLORED, SAFE PLASTIC LOOP CAPS - The loop caps come in 6 vibrant colors (white, blue, green, red, black & orange) for easy identification. Features silicone lining to prevent leaks. The perfect to-go glass bottles you can bring with you anywhere. With these 6-pack bottles, you can have one at home and another one in the office and 4 more to give as gifts! ✔ GREAT FOR OUTDOOR ACTIVITIES - The loop caps make it easy to clip the bottle to a bag so you can bring it with you wherever you go. Unlike an ordinary plastic bottle, you can enjoy your favorite beverages without the taste of plastic with these glass bottles. ✔ STORE UP TO 18 OZ (20 OZ) OF BEVERAGE - The bottle can easily store up to 18 oz (20 oz) of water, juice, tea, smoothies, coffee, kombucha and other drinks. Features a large opening to easily fit ice and fruits. You can have more of your favorite drink anytime, anywhere. ✔ 100% RECYCLABLE & SAFE - Made from high quality soda lime glass that doesn't leach harmful chemicals or undesirable flavors into your drink, like plastic or metal containers do. It is BPA free, Phthalate free, PVC free, lead-free and Cadmium-free. ✔ EASY MAINTENANCE – Because it’s glass, it’s very easy to clean. Just rinse with water and wash with your usual dish soap, and rinse away! Or you may choose to put it in your dishwasher and not worry about breakage. These glass bottles are proven to be shatterproof, thus, dishwasher safe! What are you waiting for? Get your own Clean Glass Bottles with Loop Caps now!